Want to ride the latest the industry has to offer ? Call into our Mt Buller demo centre . 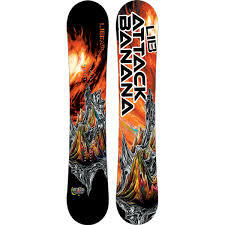 At Ski Chute 4 we have Lib Tech ,Capita and Salomon latest designs for you to take to the hill and make your day one to remember. Getting a board that is going to suit your style of riding and the conditions of the day will make for a great time. At Ski Chute 4 we have the staff that can find the right board for you . With personalized set up we give you the most comfortable professional stance you can find. You can hire boots or bring your own in to have custom fitted to the board. All Boards are tuned and waxed after each days riding. Look like a pro, ride like a pro and get in store and experience the best ride the industry has to offer. What Technology am I getting with the Lib Tech? *7 strategically located edge serrations provide unreal edge hold and control in all conditions. Deepest serration located in the un-pressurable area between your feet bringing the critical mid section of your board to life. *Engineered for snowboarding : Rocker between your feet/Cambers outside your feet. *Central rocker builds in carve, edge hold and float. *Outboard camber builds in pop, stability and control. Hit this link to See Melbourne’s Scotty James in action taking on the world.